These are 63 Inch Fat (Wide) shoelaces for high top chucks with nine eyelet pairs. The laces are 63 inches in length and are between 9/16 and 5/8 inches wide. Wear with chucks with nine eyelet pairs or with eight eyelets if you want extra lace at the top. Other 63 Inch Wide Shoelaces for Chucks. Two print pattern shoelaces are available in a 63 inch length. The patterns are black and white checkers and black and white skulls. The laces are 63 inches in length and are 3/4 of an inch wide. 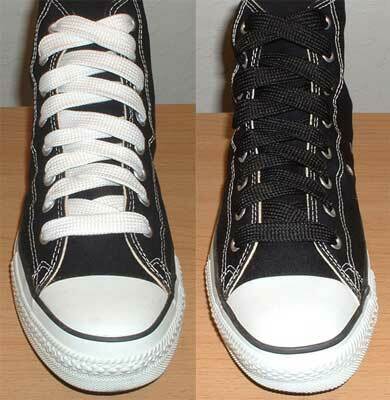 To see how checkered shoelaces look on various pairs of chucks, go to the Checkered Print Shoelaces On Chucks Gallery. To see how these laces look on various pairs of chucks, go to the Black and White Skull Print Shoelaces On Chucks Gallery.